Environmental perspectives need to be incorporated into business to realize sustainable environmental management instead of carrying out business and environmental preservation activities separately. The Ricoh Group has traditionally promoted the acquisition of ISO 14001 certification by each business site and division, aiming to fortify its environmental management system. Starting with Ricoh Gotemba Plant, which received ISO/DIS 14001 certification in 1995, all major Ricoh production sites in the world were ISO 14001 certified as of March 2000. In 2001, the sales group in Japan as a whole was ISO 14001 certified. Sales companies other than those in Japan are also making every effort to acquire ISO 14001 certification. Thus, the Group has promoted the creation of a climate for sustainable environmental management by all employees through the acquisition of ISO 14001 certification. In this climate, the Group carries out various business activities that incorporate environmental viewpoints. At present, the Group is promoting the integration of management systems aiming at further harmonizing business and the environment. The range of system integration is expected to continue expanding in the future. *Ricoh's domestic sales subsidiaries, Ricoh Technosystems Co., Ltd, Ricoh Software Co., Ltd. and Ricoh Business Expert Ltd. are included in the scope of the certification. 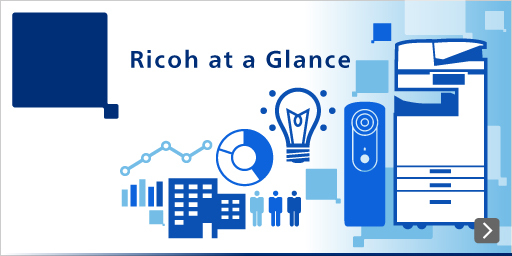 To realize sustainable environmental management, the Ricoh Group has been making every effort to establish its EMS. Starting with Ricoh Gotemba Plant, which received ISO/DIS 14001 certification in 1995, all major Ricoh production sites in the world were ISO 14001 certified as of March 2000. In 2001, the sales group in Japan as a whole was ISO 14001 certified. Sales companies other than those in Japan are also making every effort to acquire ISO 14001 certification. Regarding the companies and sites that newly joined the Ricoh Group, a standard has been set in which they are required to obtain ISO 14001 certification within three years. The newest member to the AP regional group, RID was successfully certified for both ISO9001 and ISO14001 in March 2009. The certification will cover the head office in New Delhi, as well as all branch offices including Mumbai and Bangalore. The audit was carried by QS certification services, a Swiss based certification organization, and focused mainly on the company's quality and environment management system. All sales subsidiaries in the AP region are ISO14001 certified.